Despite a slowly recovering economy, the proportion of Americans who identify themselves as middle class has dropped sharply in recent years. Today, about as many Americans identify themselves as lower or lower-middle class (40%) as say they are in the middle class (44%), according to a recent Pew Research Center/USA TODAY survey. The nationally representative survey of 1,504 adults conducted Jan. 15-19 found that the share of Americans who identify with the middle class has never been lower, dropping to 44% in the latest survey from 53% in 2008 during the first months of the Great Recession. At the same time, the share of the public who says they are in the lower or lower-middle classes rose by 15 percentage points, from 25% in 2008 to 40% today. As a consequence of these shifts, the difference in the proportion of Americans who say they are middle class and those who say they are in the lower classes has fallen from 28 percentage points in 2008 (53% vs. 25%) to a statistically insignificant 4 points today (44% vs. 40%). The survey also found that the upper classes have not been immune from the changes reshaping the middle and lower classes. 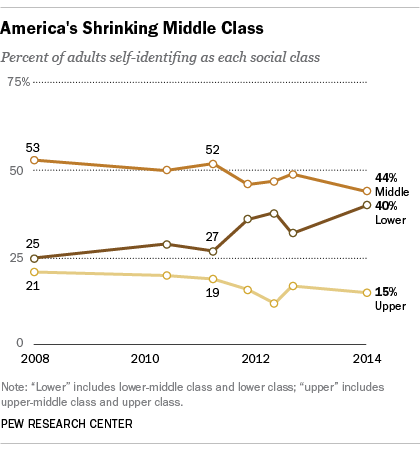 In 2008, about one-in-five Americans (21%) said they were in the upper or upper-middle class. Today, only 15% place themselves at or near the top of the social and economic order. The findings from the latest survey suggest a significant part of the change in the size of the middle class and lower classes has happened in just the past two years. In a July 2012 Pew Research survey, about half (49%) of the public identified themselves as middle class, five percentage points more than do so today. In a closer look at the data, we found that virtually every key demographic group saw its social standing slip as the proportion of Americans who identified themselves as lower or lower middle class increased over this time period. But the decline was not experienced equally by all groups. For example, in 2008 about a quarter (24%) of those with some college experience but no bachelor’s degree placed themselves in the lower or lower-middle classes. Today, that proportion has about doubled to 47%, a 23 percentage point increase compared with the overall 15-point rise. In contrast, the percentage of college graduates who identify themselves as being in the lower or lower-middle class rose only 8 percentage points to 20%. Young adults ages 18 to 29 also were disproportionately more likely to report a decline in social standing. In 2008, a quarter of all young adults identified as being in the lower or lower-middle class; today about twice as many do (49%), a 24-point increase. In contrast, the share of adults 65 and older who say they are in the lower classes increased by 10 points to 31%. The increased reluctance of the American public to self-identify as middle class is consistent with recent economic trends. According to the Census Bureau, the median household income in the U.S. decreased by 8% since the Great Recession started in December 2007—from $55,627 in 2007 to $51,017 in 2012 (all figures in 2012 dollars). The median income in 2012 was at the same level it was in 1995, a setback of 17 years. Moreover, losses have been greater for households in the middle of the income distribution than for households at the top. For households in the third quintile of the income distribution, average income fell by 8% from 2007 to 2012. Meanwhile, for households in the highest quintile, average income fell by only 2%. The net result is growing inequality in the income distribution. A separate study we conducted in 2012 also found a hollowing of the middle of the income distribution. The study used Census Bureau data to classify adults into lower, middle or upper income tiers depending on the income of their household relative to the overall median. It finds that the share of adults in the middle income tiers has fallen in each of the last five decades, from 61% in 1971 to 51% in 2011. Economists also report a lack of jobs growth in middle-skill, middle-income jobs. An analysis by the New York Federal Reserve Bank found that employment in middle-skill jobs increased by 46% from 1980 to 2009. Meanwhile, employment in low-skill jobs increased 110% and employment in high-skill jobs increased 100%. This phenomenon of “jobs polarization” is perhaps most assiduously studied by David Autor, an MIT economist. His research demonstrates that employment growth over the past three decades has steadily gravitated toward low-skill jobs.